Get ready for a day of Jedi training! Don't leave home without your favorite beverage and the courage of Rey leading your way. 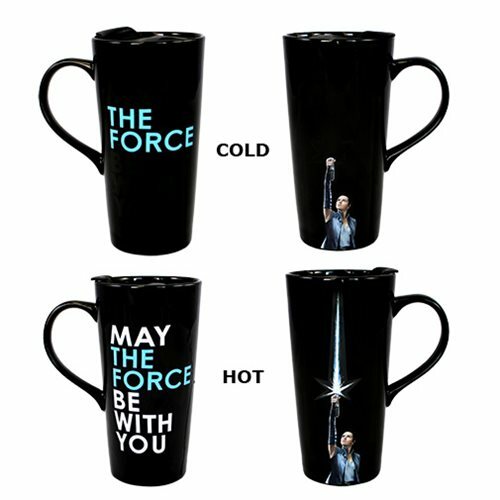 This Star Wars: The Last Jedi Rey Ceramic Travel Mug has awesome heat-change properties that reveal hidden graphics from Episode 8 when you add hot liquid. one side says, "The Force", and water and it changes to read, "May The Force Be With You." The other side shows Rey, reaching to the sky, but add a little heat and her light saber blade powers to life! Holds up to 20 ounces of liquid. Hand wash only. Not dishwasher safe. Do not microwave.